Tony award winner Idina Menzel — best known for her portrayal of Elphaba in the original cast of Wicked — is an undisputed face of Broadway today. Since her professional debut as Maureen in Rent over 15 years ago, Ms. Menzel’s voice, stage presence, and personality has grown from a young 20-something eager to grab life by the horns to a wife, mother, and tenured performer who continues to do the same. What makes Menzel a role model and an icon in the music world isn’t just her powerful voice. What makes Menzel a role model and an icon is her ability to connect with a room full of people she doesn’t know. Thursday night’s opening Pops performance of “A Date with Idina Menzel” featuring the National Symphony Orchestra and conductor Marvin Hamlisch at the Kennedy Center’s Concert Hall is proof. This wasn’t Menzel’s first time at the Kennedy Center. 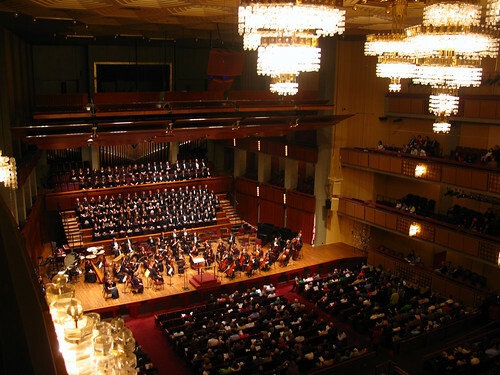 Menzel previously appeared at the Kennedy Center in December 2008 to sing “Don’t Rain On My Parade” when Barbra Streisand was honored for lifetime achievement in the performing arts. According to Menzel, that was one of the scariest nights of her entire life. Think about it – first you’re asked to sing at a show honoring your musical idol. Then you’re the one asked to sing one of your idols most memorable songs. And then, to make things even harder on yourself, your idol’s sitting in the center of the audience with a clear shot of you while you’re singing? Hats off to you Ms. Menzel for being able to sing under such circumstances. The evening ended in celebration while Menzel did a handful of tequila shots in the back of the Kennedy Center alongside actor-singer-husband Taye Diggs (who she met performing Rent on Broadway), but she deserved it. Why? Menzel, Diggs, and Streisand were all sitting at the same table at the show’s after party. Streisand didn’t say one word to Menzel the entire night – until the end. “You sang tonight?” Streisand asked. “Yes, that was me,” Menzel said. “You were good,” Streisand answered. Let it be known, Ms. Menzel, that you are more than good and you deserve to know. Pops concerts offer audiences an intimate experience with music’s greatest vocalists. Menzel’s performance was no exception. She stood center stage in a gorgeous purple gown and played the role of storyteller before each song by explaining why the song was selected, what it reminded her of, and what kind of impact the song selected has had on her life as a singer. Menzel’s off-the-cuff remarks during story time ranged from inviting the popular boys in her middle school class to a party at her house to changing her 13-month-old son Walker’s diapers. She spoke about love and life and how the two are interchangeable. She even forgot the words to start the second verse of Lady Gaga’s “Poker Face,” which she performed during her recent guest appearance on the Fox hit show Glee, but she laughed it off. Was her performance of the Gaga hit as good as her duet with blossoming star Lea Michele on Glee? It was pretty close. What made it better was the story she told about the song. For the non-Gleeks of the world, Menzel portrayed Glee’s main character Rachel Berry’s (played by Lea Michele) mom. “Poker Face” was the song selected for the two to sing as a duet to commemorate the coming together of the pair after being reunited. Here’s the thing: “Poker Face” has nothing to do with a mother-daughter relationship. It also has nothing to do with much of anything portrayed in Menzels’ character line. But it’s a fun song that sounds magnificent with an orchestra even if some of the words and phrases make little to no sense. Menzel’s humorous take on the use of “Poker Face” as part of the mother-daughter relationship on Glee turned the Kennedy Center Concert Hall into an off-beat comedy club. Laughter ensued, audience members wiped away tears from said laughter, and Menzel kept the act up the entire night. The evening’s finest moment wasn’t an expected show-ending rendition of Wicked’s “Defying Gravity” or an encore performance of Annie’s “Tomorrow.” Both were fantastic routines with a genuine voice backing up the song’s sentiments, but Menzel took it upon herself to garnish the night with a spine-tingling surprise gift for her audience. Before the orchestra started “Defying Gravity,” Menzel removed her in-ear monitors. “I think I can do this without these in,” she mumbled. Then she put her microphone down. No one knew what she was trying to do. Conductor Marvin Hamlisch looked confused. Menzel appeared to be nervous. It looked like she was ready to exit the stage. Then, she opened her mouth and started singing. “I’ve heard it said that people come into our lives for a reason,” she began. Those are the opening lines to a song from Wicked titled “For Good.” It is a heart-wrenching song describing the relationship between the witches of Oz. Never in my life have I heard such an organic performance from a singer of her caliber. Menzel, in that moment, was mesmerizing. Her voice filled the room without any assistance from a microphone. She’s that powerful of a musical force. Some people say “Thank You” by filling out generic cards they bought at a CVS Pharmacy. Idina Menzel says “Thank You” by singing a song that means the world to her a Capaella at the Kennedy Center. For that, Ms. Menzel, this singer/writer would like to say just one word: thanks. For more on “A Date with Idina Menzel” from the Kennedy Center, visit Rachel’s personal blog The Chicago to DC POV. Great write up of the concert. I was there in the front row. I will say that many in the audience knew exactly what she was about to do when she put down the mic. She actually started singing For Good acappella (sp?) at all of her concerts a little over two years ago when she performed in DC at the Synagogue at 6th and I. On Thursday, I was crying before she even sang the first note :)! To hear her fill the Kennedy Center with that song and that voice was pure magic. Love Idina but her DROMP at Streisand thing wasn’t great so it was nice of Babs to say it was…. And Poker Face does kind of fit the storyline in a way that both people were trying to hid their try emotions. Love to see her live someday. I was at The final performance Saturday – front row, stage left. Menzel was absolutely magic. and the highlight for me was Defying Gravity. She sang AND ACTED it to perfection…standing ovation, and tears on her part at the end….pure magic. What did she sing for an encore? On Thursday, she sang Tomorrow for her mom and on Friday she sang What I Did For Love. My husband and I almost tried to get tickets for Saturday, as we loved every minute of her first two performances. She is one of a kind. On Thursday night my daughter was wearing her Idina t-shirt and Idina saw it and said “I like your shirt.” She made my daughter’s night! Tracey, I was there Saturday too. She did both What I Did For Love and Tomorrow as encores. It was the last night so I guess they figured why not. This whole night was amazing. And I agree, For Good acapella was a highlight. I saw her perform a similar set list at Wolftrap in July and the sound didn’t carry as well out on the lawn so she had to use the mic, but she took it away for the line “By a wind off the sea.” I was pretty near the back and it almost blew me over. She’s inhuman. i don’t know why but this review brought tears to my eyes. thank you. Caitlin, thanks for the info. I live in Vienna, but was out of town when she performed at Wolftrap, which broke my heart. I was so excited that she came back to the DC area so soon! There is something so special about Idina and this review captured it so well, much better than the Washington Post review, which didn’t even mention that she sang For Good and Defying Gravity. I just wish someone had managed to sneak some video of any of the shows. The one song that she sang that I didn’t know, Asleep on the Wind, was amazing. OMG Asleep on the Wind was probably the only I didn’t recognize and I was absolutely mesmerized. I mean, her voice with that melody and the lyrics, just… everything. I’ve tried to find the song since and literally the only place it seems to exist anywhere online is Amazon. I think Jimmy Webb wrote/sang it as part of a movie score. I know that she’s about to start recording her next album which is this same eclectic mix meets orchestral cohesion like at these concerts and I REALLY hope she records that one. SO gorgeous. My daughter and I did the same thing and she tracked down Asleep on the Wind. We listened to Jimmy Webb’s version (the only version) and I mean no disrespect, but it pales in comparison to Idina singing that song. I hope she records it and I hope she sings it in future concerts and someone gets it up on youtube. I need to hear her singing that song again :)! AGREED! If nothing else I’m hoping some audio recordings from the Kennedy Center might surface on YouTube in the next week or so.